If you are swamped trying to manage the special services offered by different carriers, then StorePep is the perfect solution for you. With StorePep, you can integrate and display real-time shipping rates from multiple carriers at checkout, along with any special services like Proof of Delivery that you might have subscribed to. Proof of Delivery (or POD) is a special delivery service provided by carriers which essentially acts as a confirmation provided on receipt of goods. This is usually done with the help of a signed form specifying that the shipment has been received. POD is important for all companies with a delivery system. In any delivery process, when the product reaches the customer from the warehouse, POD acts as an important document because it makes sure that the product has reached the destination and some sort of trust is developed between the customer and the company. This becomes all the more important if some legal or financial documents are to be exchanged between them. The second is Electronic Proof of Delivery or E-POD which is the preferred method for popular shipping carriers like UPS, FedEx, and DHL. With E-PODs, instead of a paper document, the delivery executive carries an electronic device (a smartphone or mobile computer) that the customer has to sign on. After this, a document of the POD will be emailed to the customer or it can be downloaded from a tracking link provided to the customer. 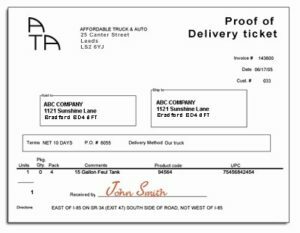 DHL’s Electronic Proof of Delivery allows the customer to get delivery details and an image of the receiver’s signature that is captured digitally. There is no need of calling customer service to get the details of the POD since the customer can view, download, print, or email proof of delivery documents usually within an hour of delivery. There may be some situations when for operational reasons a digital signature could not be captured. So, it won’t appear on the Proof of Delivery details. But it should still include who signed for the shipment and the date and time the delivery was completed. How to achieve Proof of Delivery using StorePep? DHL’s Proof of Delivery service can be accessed through StorePep’s unified dashboard. As soon as the order has been imported into your StorePep account, select the order, change the order status to Initial, and under “Bulk actions” click on “Add DHL Special Services”. After selecting DHL special service, select the “Proof of Delivery” from the options available. StorePep can help you get the best out of your DHL account. You can even toggle the special services offered according to your need and juggle multiple carriers at once, from the comfort a single, unified interface. In case you have any questions, just fill out our contact form and our specially trained agents will get back to you.